People, I am way behind on the baby knitting. The baby this sweater is going to was born yesterday; fortunately, the baby is significantly smaller than the sweater is going to be so I can pretend I knew that and was ‘thinking ahead’. Also, the reason this looks like a wadded up ball of weirdness is because these particular #2 circular needles are way too short for this project. Using my keen psychic abilities, I see a visit to my local yarn store for a set of #2 Addi-Turbos, 32” length. Ordinarily I would not do that, I’d make do with these for this one project, but I have two (2) more of these exact sweaters to make and I am not dealing with this ‘too short circular’ thing through the rest of this AND TWO MORE. This is a drag!! I can’t see my work, the stitches are all scrunched up together and I can’t tell if I’m doing the patterns right! And also I keep ‘zip-dropping’ stitches! What is ‘zip-dropping’, you ask? Ooooooh, my knitting friends, I know you know about this one. This is where you tug swear to GOD with great gentleness at your work, you know, kind of twitching at the stitches either to get a good look at your recent work or to get more stitches in position to knit and then? Z-Z-Z-Z-Z-Z-Z-IP! Approximately 274 stitches shoot off the needle and begin mischievously ripping themselves all the way back down to the cast on edge. Anyhoo, you’ll have to take it on faith that this wadded up ball of weirdness is Rutelilje, from Dalegarn Baby Kolleksjon Nr 129 (now out of print, but Personal Threads still has four copies as of this morning). 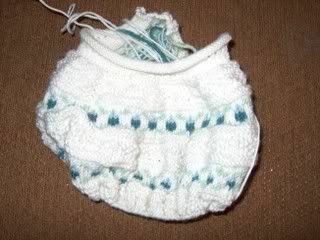 I’m doing this one in Debbie Bliss baby cashmerino. Sure, ‘cashmerino’ allegedly refers to the fact that it is cashmere and merino. But you want to know why it’s really called ‘cash’merino? Because it is not a cheap yarn. KnitPicks has spoilt me to my very core with their inexpensive ‘Swish’ for baby clothes – but I needed a finer weight for this one and was unable to find anything else so there you are – this one is being done in baby cashmerino, and the other two will be done in the actual Dale of Norway Baby Ull which is likewise not cheap. But it is very pleasant to work with so I’m (mostly) shutting up about how much it cost. It is 55% merino wool, 33% microfibre (oddly, ‘microfibre’ is tripping my ‘that ain’t spelled right’ flag, even though ‘fibre’ does not) and 12% cashmere, a nice blend which gives warmth, softness, and then you can toss it into the washing machine (lay flat to dry, though, thank you). Now I told you all that so I could ask you this: what has happened to the nature of time? Specifically, what the heck is up with the way nine months passes? See, when I was the one making the babies, nine months was this incredibly long period of time that just sort of inched along and I’d been pregnant, like, forever and then finally, nine loooooong months were over and finally I had the new baby and could FINALLY get on with boozing it up my life. But obviously, something has changed about the way time works. Because now, nine months can go by before I have even had time to recognize the words, “I’m expecting! Baby should be here around the first of April!” as meaning that I should be putting something on the needles for an Impending Arrival. I have known about this particular baby since…October? And yet I was caught completely by surprise by the announcement last week that the c-section was this week. Whaaaaaaaaat? See, with the twins, I can cut myself some slack. We had ‘radio silence’ from the first announcement until they were actually here, so, well. Fell right off my radar. But this other baby? Pshaw, people! This is someone I think about regularly. This is someone who features rather large in my husband’s past. This is someone whose voice regularly soars out of my CD player. This is a kitchen-door kind of friend. So obviously, I cannot possibly have so thoroughly spaced on her pregnancy. There is patently something going on in the space-time continuum which causes nine months to pass differently for her than it does for me. Her nine months went by in, like, three days over here in the Den. lfI love the way you write!!! Take care- have a nice Easter! and- by the way- how on earth do you manage to find time to knit in between 4 children, laundry, husband, housework and "understanding boss(ehem)"? 1. This bizarre time warp is the reason I switched to hats and booties after I birthed my 4th child--with 11 (count'em) new babies that I know of coming this year, I could not possibly manage my (record) 14 blankets of a previous year. 2. Since you live near me, I will tell you that Babetta's (my LYS) has this self-striping/patterning acryllic worsted yarn that's gorgeous, has a wonderful hand, comes in a big put-up (for yarn-snob grade acryllic) and makes a GORGEOUS baby sweater with 2 skeins. I say this only in the interest of preserving your sanity because this time warp that you speak of can give you project whiplash, and no one wants that. Lordy how I can testify, sister. Nothing worse than pulling a needle _clear_out_ of the work-in-progress which I did twice just YESTERDAY. snort! Zip-dropping is my middle name.